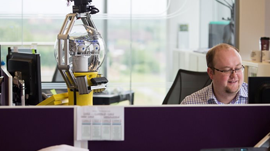 Programmed with the latest artificial intelligence software, Betty will spend the next two months working as an office manager at Transport Systems Catapult monitoring staff and check environmental conditions. The robot, developed by engineers at the University of Birmingham, uses NVIDIA GPUs for various forms of computer vision — like feature extraction — and 3D image processing to create a map of the surrounding area. This allows Betty to identify desks, chairs and other objects that she must negotiate while moving around the office, and observe her colleague’s movement through activity recognition. Betty is part of an EU-funded STRANDS project where robots are learning how to act intelligently and independently in real-world environments while understanding 3D space.